Join the discussion on our forums! Come discuss Plague Scientist over in our dedicated Plague Scientist discussion topic. Combo: Give a friendly minion Poisonous. The excruciating pain means it's working! Another surprising good card. I thought it would be an Arena only card, but I am seeing it more often in every Rogue decks, even some Miracle Rouges are runing it. Any resemblance to existing cards is fortuitous. Knife Juggler+ Plague Scientist + a few 1 drops. 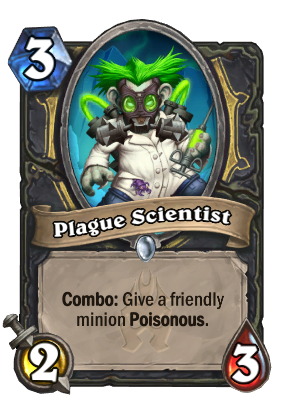 Plague Scientist is going to be the new MVP for Rogue. Wild Pyromancer + Plague Scientist-->Wild Pyromancer+ Shadowstep-->Plague Scientist. More of an arena card than constructed IMO. Not a bad card though. Just a few better ones out there, that's all. Assassinate -> Vilespine Slayer(Oh now I have 3/4 body) -> Plague Scientist (my body lowered but who cares,i m now 3 cost whoa). Baron Geddon + Plague Scientist for permanent board clears? Wild Pyromancer provides a single board clear, but the Baron Geddon combo would provide a board clear every turn until it's removed. That being said, it's probably a lot more practical to use the Wild Pyromancer combo in an actual deck. Thought it was pretty good at first, but its combo not battlecry. Makes it alot worse imo. It is a good arena card. There's no way it could see constructed gameplay. Envenom Weapon is a much better card in general but even it is only great in arena. Seems pretty broken with Knife Juggler but even more broken with Baron Geddon and Wild Pyromancer. "I'M IN CHARGE NOW! AND I'M POISONOUS! This is my favorite card so far, helps out tempo and jade rogue decks a lot, imagine this on jade swarmer like wow. Great card for those decks, and a great tool for rogues in arena. LOVE THIS!!! I am a big fan of this card design in rouge. at the moment miracle rouge is the viable archetype of rouge, which does not utilize having a board. To be good, this card would have to either be paired with a charge minion or have a minion stick on the board, and neither of these things generally follow the play style of rouge. the best case scenario i see is on turn 4 swashbugler, pull patches, and combo this to clear something, but in genral i think this will just clog up your gadgetzan draws. in the current meta, i don't believe this card would see any play. it is not good against board flood decks like token druid and evolve shaman, which runs the current ladder; not to mention in most draws in rouge it would be a dead card. with life steal becoming a new mechanic to give rouges healing, a new more board centric style of play may allow rouge to drastically change its decks to include cards like this. I believe this card can be good if the meta does shift to a tempo midrange style allowing early game single target removal to be viable.